The two-time All-Ireland winner is pleased to have them back in Liam Sheedy’s set-up. Eamon O'Shea returns to the management team while Brendan Maher is back from a cruciate injury. THERE ARE PLENTY of positives in the Tipperary hurling camp at the minute — and captain Seamus Callanan is pleased with how all is going under Liam Sheedy. “Ah, it’s great to have Liam back,” the two-time All-Ireland winner said at at the Bord Gáis Energy GAA Announcement in Croke Park today. The Premier county recieved a significant boost in February with the news of Eamon O’Shea rejoining the management team. 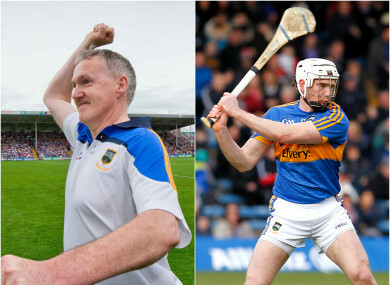 A central figure in the evolution of Tipperary hurling over the past decade, the former boss and member of Sheedy’s 2010 All-Ireland winning management team came on board in a ‘support role, not as a selector’. And Callanan, more than anyone, is delighted to have him back. “Great to have him around now,” he smiles. “I’ve often said Eamon has been huge for me and huge for that group, the older group that’s in the panel. It’s great to have him back. O’Shea hasn’t been involved a whole pile yet with Tommy Dunne and Darragh Egan overseeing most of the hurling and Callanan doesn’t know the extent of his involvement just yet, but the Drom-Inch man is just pleased to be reunited with an old mentor. O’Shea, he says, really developed his game. “Eamon gave me the freedom to go out and express myself in training, become the best player I could be. He believed in me. He’s a very intelligent man about hurling and I love the way he looks at hurling and views hurling. We had a connection on that. “He makes you enjoy it. When you are enjoying your hurling, you always seem to play better. “He’s like us all — we love Tipperary hurling. Eamon just wants to see us perform to our ability. Whatever way he can help in that process, he wants to do it for us. Another recent welcome return to the fold is that of Brendan Maher. The 2016 All-Ireland winning captain tore his cruciate last June as Tipperary’s championship hopes all but ended. The Borris-Ileigh star’s return came in the second half of last month’s league quarter-final defeat to Dublin in Thurles, giving the home crowd something to cheer for. And again, Callanan — no stranger to injury himself — more than anyone, is delighted to have him back by his side. “Brendan has shown his character by coming back from that injury,” he continued. “I suppose the physical conditioning that he is in after coming back from that injury [is great]. He didn’t come back in poor shape and only trying to start from there, he came back in better shape than he was ever in. “He’s a real inspiration, as he always was on the hurling field; he was an inspiration on his comeback. When we were training away, we just knew that he was working as hard, if not harder. “It’s always harder when you are working in your own. He was putting in huge effort and still leading by example in everything he has done. It’s great to have a bit of game time into Brendan in the last game of the league. That return was obviously a hugely positive moment in what he admits was an up-and-down league campaign. Obviously, they would have liked to progress further but the focus now turns to the club scene, and to championship. “There’s no difference, really, in fairness. Look, it’s a great honour, but, you know, I’m there now since 2008 so there’s a lot of leaders in the panel so you kind of just try to keep doing what you were doing there. The crew that started out together and broke through simultaneously are still there and as driven as ever, the fire in their belly probably even more prominent than before, he concludes. “Absolutely. There’s nowhere else that we want to be. Playing for Tipperary is everything for us. We just want to try and make the most of it when you are there, try to get as much as we can out of it. “The thing is, every other county has lads thinking the same. It’s just we have to drive it on and hopefully bring back something to the set-up this year because last year was disappointing; to be gone out of the championship on 9 June was very disappointing. Email “'Huge boost' - Captain Callanan hails returning Tipp duo Maher and O'Shea”. Feedback on “'Huge boost' - Captain Callanan hails returning Tipp duo Maher and O'Shea”.